As of today DAC will no longer be playing BF as a clan, I apologize to those of you who really wanted to play BF as a clan but it seems we dont have enough members in the clan who are interested in playing BF for the clan. Clan members that are not playing COD4 with the clan will be labeled as "inactive" and placed in a "Inactive Group" until they become active. Err... so what you saying is that if we aint COD4 players... we are Inactive ?? Yes thats exactly what I'm saying, you have to contribute to the clan, or at least join in at what the clan is doing. I'm really not impressed with this... but i've sent you a PM about it. As I unfortunately do not see myself playing COD4 online in the near future, it is with regret that I tender my resignation from DAC. I enjoyed playing alongside some of you immensely (and that doesn't mean that I didn't enjoy playing with some of you, it just means that I didn't play with you at all ) No hard feelings. 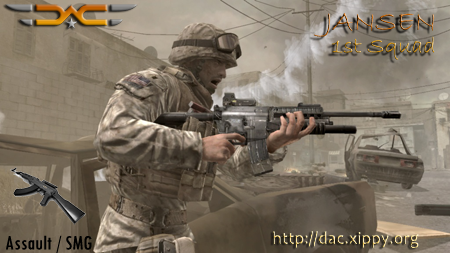 Will and Jansen put a lot of hard work into building up DAC into the great clan it is today and if they decide that as a clan DAC concentrates on playing COD competitively, then that is their decision. Thanks Org and go well my old friend. Org dit was ook baie lekker om saam met jou te speel en ons gaan jou CRACKERY mis maar jy moet weet dat jy altyd deel sal wees van DAC en dat enige clan funksies wat gehou sal word jy baie welkom is by!!! Ons kyk maar as daar n nuwe game is wat uitkom wat ons dalk as clan gaan speel en jy dit ook speel dan maak ons weer so!! Got the "congratulations" on being moved into inactive group so as with Org, I'm not a COD player. I hope to pop in from time to time on the site and give you all a hard time about whatever I can think of. This is the end of the road for me too. Thank you all for the truly excellent times and great friendships that will hopefully continue. Take care all, I'll see some of you on THE Battlefield. Go well Smaug, maybe see you in BF3!! soon!! Thanks Morph, all the best to you, maybe join us for a beer when we go publunching again? Ag nee man, I am very sad to see Morph and the other guys go. He is as much part of DAC through the Forum as the rest of us are with COD. If BF3 ever gets released Will, I'll see you there for sure. Take care guys! If we see a BF3, i'm sure we will meet again!